I promised the other day that I would walk through how I went about taking part in the challenge by PBS Media to remix loops for its Mister Rogers project. (You may know that PBS has created some great remix of Mister Rogers’ videos by using auto-tune and music loops — setting the television host’s messages to a beat). 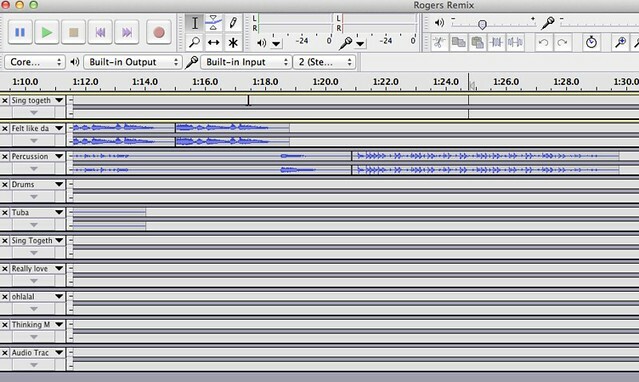 In hopes that you might dive in, too, here is how I went about the remix process. First, of course, I had to learn about the remix invitation. I can’t remember now where I first heard of it, but I think it was a tweet that someone in my Twitter stream shared out. I’ve had “remix” on the mind lately with the Teach the Web MOOC, so I was intrigued by what PBS Media was inviting folks to do. I headed to the site, and found that they had established a group in SoundCloud, where PBS was sharing out a collection of musical loop files. You could take one, or more, or the entire collection. I took everything as a .zip file to my desktop. It was pretty fun going through them – listening to drum beats, Mister Rogers’ voice talking about loving music (the overarching theme), and other things like tubas. Yep, a blast from a Tuba was in the mix. Second, I considered using Garageband, but to be honest, I still find GB a bit funky to use at times. So I turned to my old trusty Audacity for loop editing. I choose a bunch of loop tracks (not all) and moved them into Audacity. Here’s where the real work and the tricky part began. The fact that the remix probably should have a consistent beat puts the remixer into the role of music composer — lose a beat, and the effect can be pretty jarring to the listener. I spent a lot of time moving, shifting, repositioning, listening, re-repositioning, moving again, lining up and doing all sorts of tinkering with the tracks to make them fit. There was a moment when I could sense that it was coming together finally, and that the pieces were fitting together like a jigsaw puzzle of sorts. As a remixer, that’s a glorious moment, right? Finally, I was done, and I uploaded the track into my Soundcloud account, and then shared it over with the PBS Media group (as they requested for remixes). I also played around with Popcorn Maker as a way to add my remix soundtrack to the video, but in this case, my music was not in sync with the movements in the video. Of course, my intent with the remix was for audio, not for video, and I realize now that my process would have been different if I had video on my mind. All in all, it was a fun experience. Sure, it took some time, but it was time well spent. Now, I have my Mister Rogers Remix. How about you? Look at this picture. Isn’t it cute? 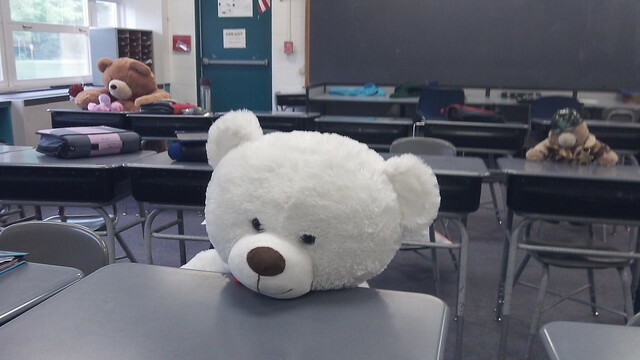 I took it the other day during our Stuffed Animal Day in writing class, after my sixth graders had gone off to Library. I love how they left their animals in their seats. We have a Stuffed Animal Day as part of a prompt around descriptive writing — they have to use good descriptive details to describe one of the animals in the room, and we have to guess which one it is. (Gets tricky when there are 20 or 30 animals lined up along the shelf). But there is another reason, too, and it is one of those things that I forgot about until the day arrived. You should have seen how excited these sixth graders (soon to be seventh graders) were when they arrived with their stuffed animals. Some were very protective of them; others tossed their animals around. It reminded me of how we really need to continue to value the connections to their childhoods. This often gets lost in the need for pushing through our curriculum, driving them to do their best on standardized testing, and working hard at learning all year long. This connection to the innocence of their age gets lost in all that, and yet a simple activity like Stuffed Animal Day …. it brings it all right back into the classroom. Come join the adventure by signing up (it’s free!) for the Making Learning Connected MOOC adventure this summer. Over at the iAnthology (a network of hundreds of teacher-writers via the National Writing Project), I posted a collaborative document and started a few lines from a poem … and then asked my friends in the iAnthology to hack the poem, remix it, add to it/delete lines, and make it into something alive via collaboration. We were using a tool from Mozilla called HTMLpad that I learned about via the Teach the Web MOOC, and the results were amazing to watch (in fact, the poem continues to grow). It only made sense to capture the unfolding of the poem (one of the features in HTMLpad is that you can watch everyone’s add via a timeline) with me reading the poem as a podcast, and so I used another Mozilla tool – Popcorn Maker — to layer in the podcast on top of the screencast. The results? Pretty interesting (see the published poem, for now anyway .. every time I look, a few new words spring up), and a fascinating example of how writers can become collaborators on a single poem. I’m honored that others dove in to collaborate and hack my words. I’m a little late to this party for sharing this video (it got lost in my draft pile) but I wanted to share out this video about the importance of learning coding and programming, and its connection to literacy. This fits in nicely with a summer camp program for high school students in which we intend to explore hacking as literacy, and the concept of learning coding as literacy is right in the mix. 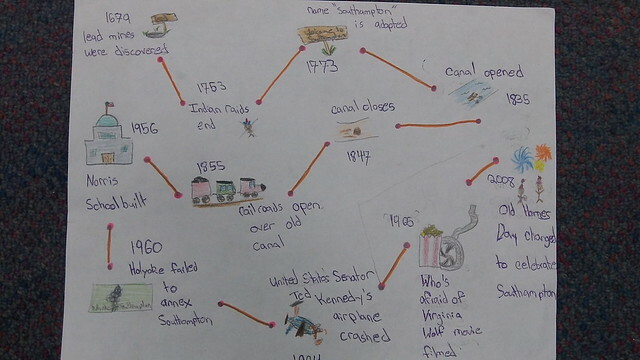 A friend asked if I would share the graphic organizer that we used to get our students thinking of their memory object as the focus of a digital story project. Of course. I suppose we all have books that others rave about, but which we can’t seem to like or get into. For me, it’s The Westing Game. Three different times over the years, I have valiantly tried to read this award-winning book by Ellen Raskin and all three times, I have tossed the book aside in frustration and confusion, and as a result, serious boredom. Seriously, I don’t get the fuss. Now, I consider myself a pretty strong reader, and I have always loved mysteries (my childhood went from Encyclopedia Brown to Ellery Queen in a heartbeat). This novel is about a dead millionaire (Sam Westing) who has left his fortune to one of his 16 heirs, but they all must play the “game” in order to figure out who killed Westing before they can claim their $200 million inheritance. The heirs are all paired up and given partial clues to a game, and each team must start from there. On the surface, that sounds fine. A good mystery to unfold, and the use of chess as a metaphor — that’s right up my alley. I can get into that. It even sounds a bit like 10 Little Indians by Agatha Christie, right? (note: one of my students made that remark to me when I was book talking The Westing Game). Unfortunately, Raskin seems more intent on adding layers of characters and clues and complexity just for the sake of the act of doing so, and not for the sake of story and character development. I didn’t care a whit about any of the characters (not even Turtle, whom I know I need to be rooting or) nor could I keep track of the little asides that Raskin writes into the story which clearly as clues for the reader, but which don’t connect with each other and are too many in nature, causing an overwhelming sense of “red herring” disease. No, I do not like The Westing Game. But I should note that I have had students who have liked it and rave about it, and another of my colleagues who used to teach it loved it. Which makes me believe it just must be me and my own style of reading. I can live with that, even if it does leave me a little confused and wondering what it is that I am missing here. Still, three times … and I’m out. I have a group of students just finishing up Kate Klise’s Regarding the Fountain, which is a small novel with a story told entirely through artifacts. My kids are always intrigued when we pull this out because it is so different from the kinds of books they are used to reading (straight narratives). 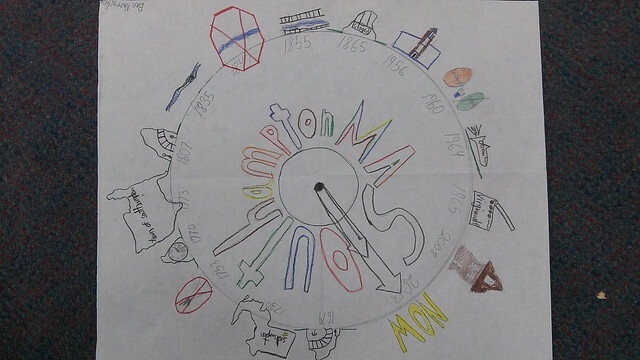 Part of the story involves students in the fictional town of Dry Creek researching and writing about the history of their town. 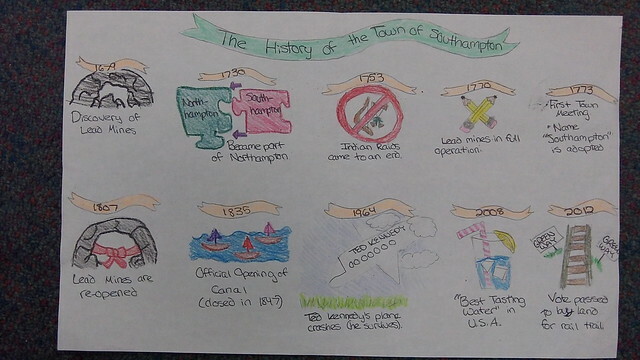 They then provide a pretty nifty visual history of what they discovered. 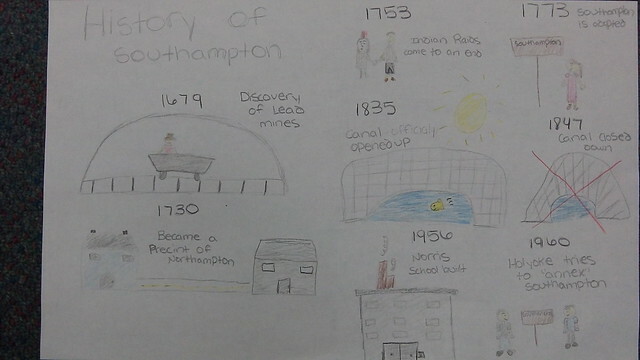 I had my students do some research on their town (culled from some historical artifacts from the town archives) and I had them create their own visual history of Southampton, Massachusetts. 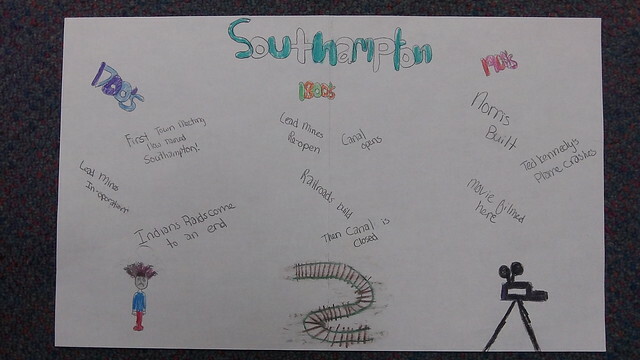 I love this connection to the book because it allows for wonderful discussions about where they live and how their town came to be, and various events that took place (Ted Kennedy’s plane crashed in the town; the movie Who’s Afraid of Virginia Woolf? was filmed here; and the town’s water was designated the tastiest in the country in 2008). All these connections to history are important.